High King Emeric is a legendary Sorcerer creature card. It is part of the Core Set. "The power and all the trappings of being a king look like fun, but it's damned hard work." "I hate this crown. It's damned uncomfortable." "Being a king may look like fun, but it's damned hard work." "Let me take out the rubbish!" "This world will be well rid of you!" "On your guard, mongrel pup!" Emeric first appeared in ESO. 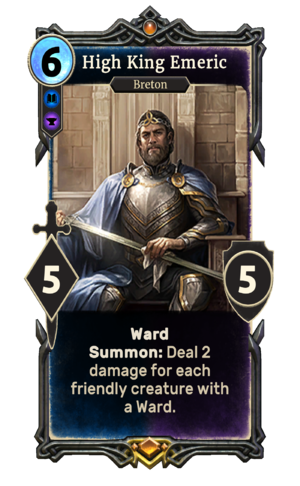 The Alliance War expansion added another Emeric card, namely Emeric, Covenant King.